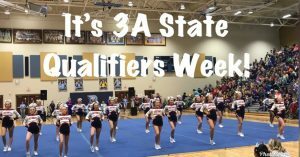 Powdersville Varsity Competitive Cheerleaders will hit the mat at 7:03pm on Thursday, November 8, at Mid-Carolina High School to qualify for State Finals! Twenty-five teams are on the schedule to compete, and 16 advance to Finals. Our Competitive Cheerleaders need our support — time for a road trip to Mid-Carolina and make some noise for our cheerleaders! You can do this, Ladies!!! #MakingHistoryEverySeason! #GoPatriots! !